Every trip has to start somewhere and I chose Split, Croatia as the starting point. A lot of people start in Paris or Amsterdam. I guess these are easier to access, especially Paris on the Eurostar. 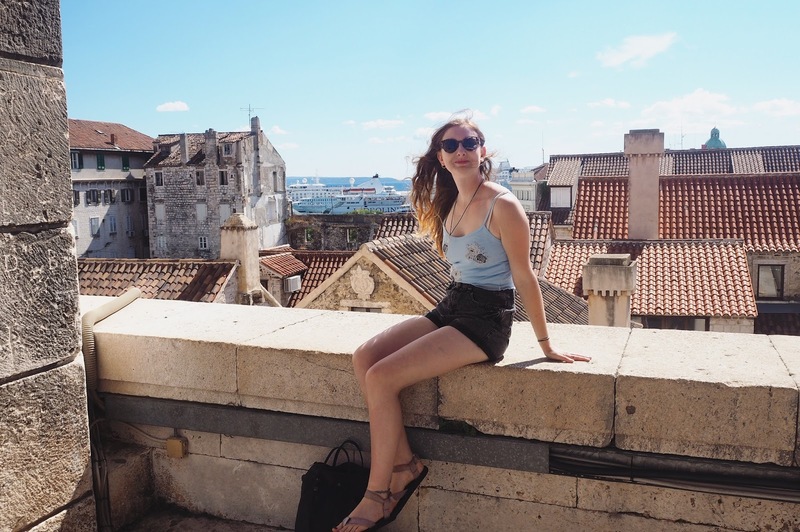 I chose Split because it was one of the furthest away destinations we were going to and partly because I wanted to start somewhere that is best enjoyed with good weather. Our trip began at the start of September and ended mid-October so I wanted to make the most of the sunshine! Old Town: Explore the narrow streets and discover little cafes and shops. Or climb the bell tower at St. Domnius. After Split, we headed to Bosnia and Herzegovina which quickly became one of my favourite countries of the trip. Our first stop was Mostar, which is probably best known for its beautiful bridge and Old Town which does make you feel like you've stepped back in time. There's so much history and culture in Mostar. Don't forget to enjoy some ice cream whilst overlooking the bridge, my personal favourite was the Nutella flavour! Sarajevo is the capital of Bosnia and Herzegovina. We stayed at the war hostel and learnt a lot about the war in Bosnia. I had no real knowledge of this war or how recent it was so it really did open my eyes. Even if you don't stay at this hostel I'd recommend going on a tour with the owner Zero One to discover the cities darker history. The Olympic bobsleigh track is also worth a visit, you can hike to it or get a taxi depending on the amount of exercise you want to do. I think the hiking route can be a little difficult to find so do your research. We headed back to Croatia and to the capital, Zagreb. Certainly different to Split, it wasn't my favourite place but I'm glad we made a stop. Especially for the Museum of Broken Relationships, even if you're not a museum lover this is a great place to see. It's both funny and emotional. There also plenty of places to have brunch, especially around the main square. Ljubljana was a great introduction to Slovenia and also where I discovered Snickers filled Crepes! Still the best crepe I've ever eaten. We were very lucky that the weather was still good which meant exploring the town was easy. Make sure you stray from Old Town and explore the other areas of the city. We did this by opting for the graffiti tour rather than the traditional. We were able to see another side of the city. I think everyone that visits Lake Bled falls in love with it. When you see pictures it's easy to see why and it's one of those places that definitely lives up to expectations. The town itself is small but the main attraction is the lake and there's plenty of ways to explore it. Walking around the lake takes around an hour. If the weathers good enough you can even take a dip in the lake. After Lake Bled we headed into Austria and were met with the slightly colder weather. However, this didn't deter us and we battled the rain to explore the sights and pretend we were Maria from the Sound of Music. We also managed to take a day trip to visit Hitler's Eagle Nest in Germany. The day trip was very easy to do and we had time to explore the Salzburg market once we got back. While very touristy Hallstatt, like Lake Bled, feels like a fairytale destination. It's expensive but well worth a day trip just to soak up the stunning scenery. We stayed across the lake in Obertraun as this worked out a bit cheaper or you can just come from the day, it's very easy to access from Salzburg. There's plenty to see in Vienna. While it wasn't my favourite destination on the trip I still very much enjoyed exploring the city and its palaces. However, my favourite spot in Vienna was the Hunderwasser House (pictured above) it was a bit more quirky than the rest of the city, it's worth visiting the cafe where there's a short documentary about the area. Our next stop was Bratislava. Initially, it wasn't on our itinerary but it was easy to visit on route to Budapest. While we were only in Bratislava for 24 hours we managed to see a lot and it became one of my favourite stops. The Old Town is very easy to explore on foot and there are plenty of options for food. If you want a good view and some cocktails head to the Lemon Tree Sky restaurant. We arrived in Budapest at the beginning of October and were surprised that it was 31 degrees! This made sightseeing very easy. I think I underestimated how big Budapest is so while we had four nights there I still don't feel like I got a feel for the city. We didn't have many early mornings though so if you're an early bird four nights is probably plenty. After the warm weather in Budapest, we were met with a much colder climate in Prague. We went from 32 degrees to five degrees. Prague was where I spent my Birthday. We treated ourselves to an Air b n b rather than a hostel. There's so much to see in Prague and you can't visit without trying one of the chocolate rings they serve in little booths along the streets. They're amazing. If you like nightlife then there's also the biggest club in central Europe to visit. Krakow was a pleasant surprise. Our hostel was only five minutes from the main square and we discovered an amazing chocolate shop which we visited nearly every day. We went on the Jewish walking tour and I'm so glad we chose this one as we saw a lot more of the city, I didn't realise how much there was to see outside of the main area.We also did a day trip to Auschwitz which was a very emotional, eye-opening day. While we had two nights here we only had one full day as our train arrived late afternoon on our first day. We decided the best use of our time would be to do a walking tour of the Old Town. We learnt a lot of history and also visited a local restaurant that served mulled beer. It wasn't as good as mulled cider but it was interesting to try it. I had a bit of extra time before my flight so I managed to fit in the Uprising Museum. Even if you're not interested in history this is well worth a visit. I learnt so much about Poland during the war and it was great to have a different perspective rather than the one we're taught about at school. My itinerary wasn't perfect. But it was also, on the whole, a good itinerary that worked for me. However, there's always room for improvement so I thought I'd tell you what I'd do differently now I've finished my trip. Like the actual itinerary, the changes I'd make are personal. While we were able to see the main town and sites in Mostar we had no time to explore the surrounding area. We debated whether to get a later bus to Zagreb and try and see some of the sights but decided against it as it would eat into our time there. One more full day would have been enough to see some of the areas around Mostar such as the Kravice Falls which look amazing. The main reason our time in Warsaw was so short was that our flights home were booked from there so there was quite literally no time left! Whereas earlier on in the trip we could switch things around a little we couldn't do this for Warsaw. Luckily I had nearly two days because my flight wasn't until the evening but my two friends only had one day. I felt as though I'd only explored a small portion of Warsaw. I don't think we spent too much time in Budapest but if we had got our act together and been more organised we could have seen a lot more in less time. While we spent an afternoon in Hvar it would have been nice to stay on the island for a night to enjoy some of the bars and nightlife but most importantly have more time on the island. I don't regret visiting Zagreb but I chose to take certain stops off the route as we didn't have enough time. One such stop was Sofia in Bulgaria. I think this would have been a city I would have enjoyed more but this is obviously a guess. 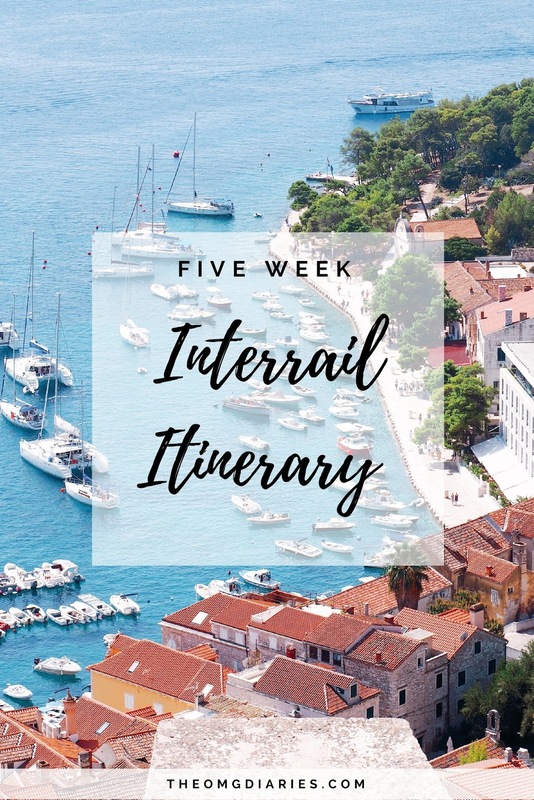 So there's my five-week interrail itinerary. I managed to visit 14 new cities and 8 new countries. It's one of my favourite trips to date. 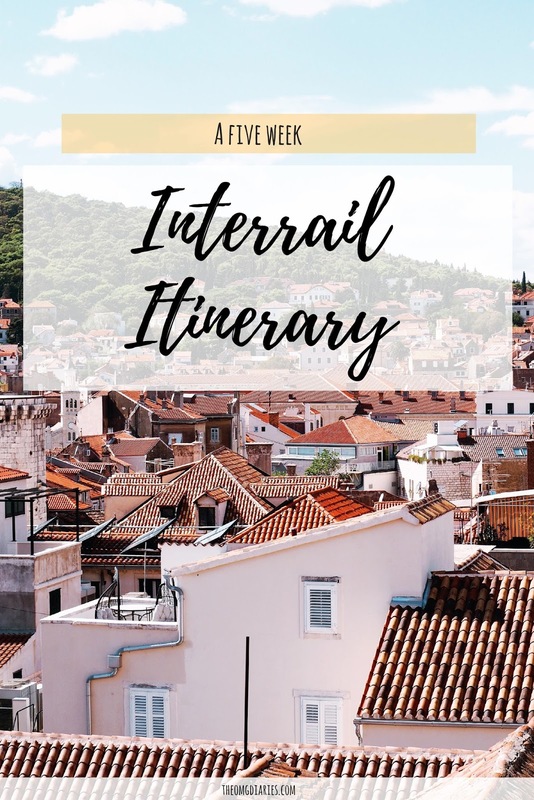 Have you been interrailing? If you want more information on the Interrailing such as how the Interrail pass works or how to begin planning your own trip then make sure you follow the links!